Vice President M. Venkaiah Naidu on Monday said that India is committed to be a five trillion dollar economy by 2025 while inviting Maltese business firms to come and invest in his country. Addressing at the India-Malta Business Forum here, Vice President Naidu said, "We aspire to improve trade and multilateral ties with Malta. Over the past few years, India witnessed a positive growth in stock market indices, foreign exchange reserves and public investments in infrastructure. Indian economy is growing at over 8 per cent and is currently one of the fastest growing major economies in the world." He stated that according to proposals made by international business and credit rating organisations like World Bank, World Economic Forum, International Monetary Fund and Moody's, India will be the third largest economy in the world. 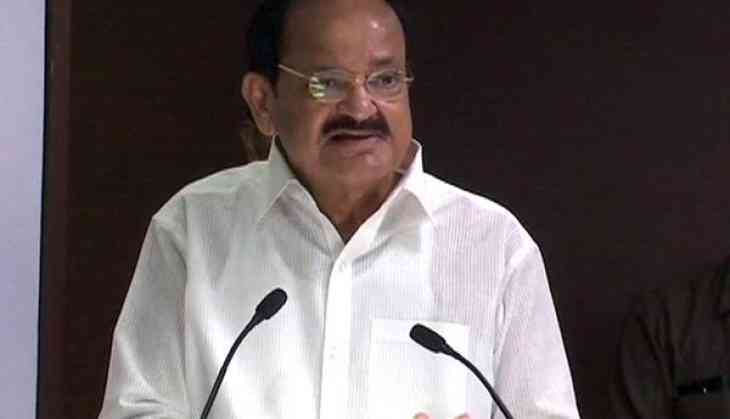 Underscoring the economic reforms taken by the Indian government, Vice President Naidu elucidated, "India has opened up. Our government has taken policies to make India a business-friendly destination. We are striving to achieve 175 GW of renewable energy as well. Steps such as digitalisation of the economy, financial inclusions, tax reforms like Goods and Services Tax (GST), which is a major revolutionary transformation taxation proposal in India. The tax net has been widened and revenues of the government are increasing. Also, interest and tax rates are coming down." The Vice President further stressed that the transformation is the motto of the government. He said, "We have seen a jump in ease of doing business rankings and people are being benefitted by direct benefit transfers, bank accounts and Aadhaar cards. Inflation is now under control. We are committed to build a $5 trillion economy by 2025. The expectations of India becoming the third largest consumer market will be a reality." Recalling Prime Minister Narendra Modi's MISIDICI (Make in India, Skill India, Digital India, Clean India) vision, Vice President Naidu said that such programmes are in full swing in order to achieve their respective targets. Vice President Naidu also reiterated that India is a good climate for doing investments, saying, "I invite Maltese investors to invest in India. Our country is a safe place for investments. I convey to both the sides to meet, greet, understand and exchange success stories and to know from each other's experiences. We can move forward." On the other hand, Malta President Marie-Louise Coleiro Preca said that the country would welcome Indian companies to invest with open arms. "We discussed various sectors of mutual interests such as trade, training, education, maritime cooperation, pharmaceuticals, Information and communications technology (ICT), tourism, film industry, financial services and block chain technology amongst others. We have many opportunities to take our relationship to the next level. This includes diverse areas of trade and business," she said. President Preca further underlined that the business forum would serve a tangible way of bringing the people of India and Malta together in trade and business. She lauded the Indian government's efforts to promote renewable and clean sources of energy. "The International Solar Alliance (ISA), where the countries having solar capacity are aiming to maximise their resources and meet the target by 2030, set by the United Nations. Malta is looking forward for collaboration in this sector and joining this important alliance," the Maltese President added. President Preca said that both Malta and India would continue to develop socio-economic ties that would eventually lead to a stronger sustainable friendship between the two nations. Referring Malta as an `ideal candidate` for the Indian businesses to invest, President Preca elucidated, "Malta is a perfect position for the location of Indian companies. Malta has an excellent connectivity, skilled labour and together with English as an official language and membership with the European Union makes Malta an ideal candidate for business continuity. Many Maltese businesses are looking for new opportunities and avenues for expansion beyond Malta." President Preca further went on to say that both Malta and India would continue to strive on its strengths, find right opportunities and collaborate not only for mutual benefit but also for the prosperity of both people of two countries. Earlier, India and Malta signed three Memoranda of Understanding (MoU) relating to tourism, maritime cooperation and exchanges between the Foreign Service Institute of India and the Mediterranean Academy of Diplomatic Studies, University of Malta. In addition, India has offered Malta to take advantage of its highly skilled professionals in the field of Information and Technology (IT), financial services, health, pharmaceutical, transport, freight and tourism. The big GST question: Why should I foot your bill?